We all have something right? An old sweatshirt, a hat, a pair of BVDs. Something that we have managed to keep all this time. It may have started as a fluke and just seemed to always be around and by now it has grown into an icon of years gone by and achieved shrine worthy status in your home. No one understands it but us and even though it is worn and torn it has become one of our most prize possessions. 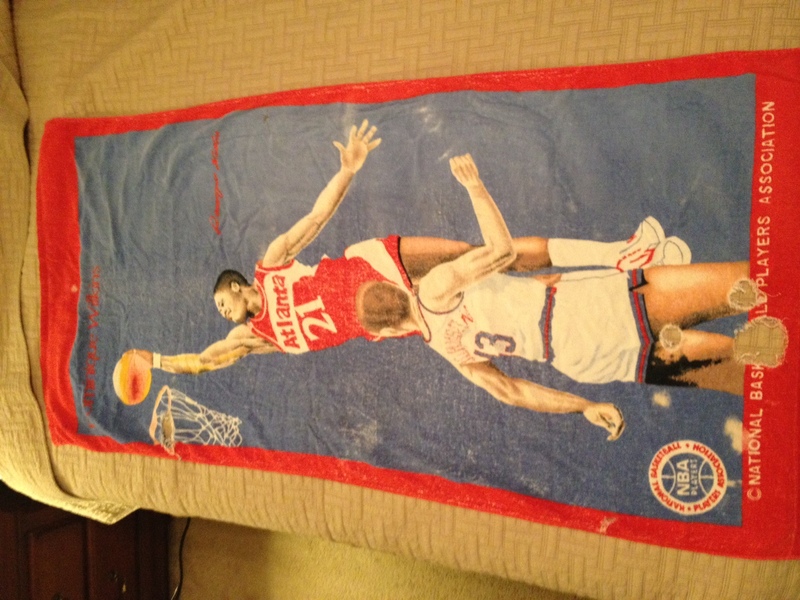 For me it is this sweet beach towel. Santa brought it to me when I was a wee lad and it has stuck with me ever since. How sweet is Dominique Wilkins dunking in all of his short shorts glory? Things have a way of passing in and out of our life with little consequence but every now and then something sticks around. I love this beach towel. Not only because is has the Human Highlight Reel on it, but because it takes me back every time I see it. Just like the smell of mothballs will always take me to the hall closet of my grandparents house where they kept the Dukes of Hazzard board game, seeing this towel reminds me of growing up on Azalea Circle. Having a tangible reminder of a memory is totally sweet even if it does have holes in it. What is that one thing that you still have? P.S. Remind me to dedicate an entire blog to The Dukes of Hazzard because little in this world is sweeter than that show. Do you see what you are doing there Mr. high importance email? I notice the trend, everything you send me has a red exclamation point on it and when I open it you are forwarding me a chain letter or asking to buy a box of Tagalongs from your daughter. That actually may be a bad example because it is one of the few emails from you I have ever responded to. 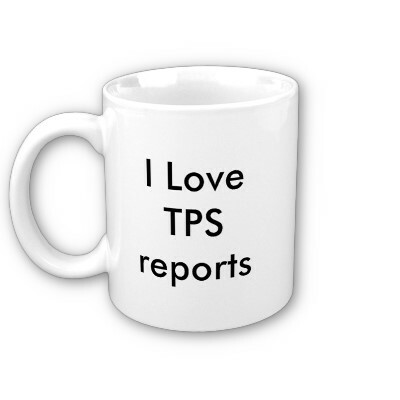 What are you going to do when it comes time to notify us that you actually have re-formatted the TPS reports? Do you have a dial that goes to 11? You are crying digital wolf, my friend, and no one cares anymore. While I am at it I should remind you that a read receipt on your message should just be called a click receipt because I don’t read any of them,I just click that box to make it go away. I know that you have a voice and you want it to be heard. I know what it is like to feel like you are drowning in a sea of cubicles but it is time to re-evaluate. Are you trying to be that jerk that talks above everyone and always acts like what they are saying is the most important thing ever? It seems like you are. You don’t have to reply to all when your message is only to one person. You don’t have to set up tons of auto forward rules so I get email from you on the nights and weekends. I am not trying to hurt your feelings I just want you to take a second of self-reflection. All of those extra email bells and whistles can be totally weak. 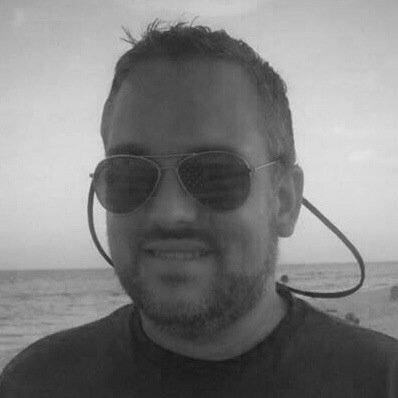 This entry was posted on Monday, February 27th, 2012 at 8:46 pm	and tagged with basketball, Dukes of Hazzard, email, humor, memories, office, Random, short shorts and posted in Uncategorized. You can follow any responses to this entry through the RSS 2.0 feed. I have a comforter that I am actually wrapped up in right now, that I have had since a teenager. I am surprised it is still usable. there are spots that are totally see through, but that does not bother me at all. The edges are wearing down. I also had this grey polo shirt that I had worn for so many years that the fold of the colar has worn to the point that the top part of the colar came off. LOL. that is too funny eh? Even the arm band parts are worn to the point of being like two. There were so many places on the shirt that were worn down so much to the bare fabric being totally see through. Finally about 3 months ago, i threw it away. I still miss it. I llike your blogging very much and will subscribe to it. Thanks for putting a smile on a chronic pain person who does not get to smile much. 1. I’m almost 25 and I still sleep with the teddy bear I got on the day I was born (my boyfriend does not appreciate our third wheel). Bam. He just got hit with 100 read recipts. Muah hahahaha!!!!! Sweet lord you are a genius. I can’t wait to do exactly that. Awesome idea! oh my god, i must be horrible juvenile and stuck in the past, i’ve got A TON of memorabilia. from a swiss army knife with my name on it, to my old high school track shoes. present and future, you’re on my list. I’m going to laugh about ’11’ all day. I hate email confirmations, especially on every single email. We’re definitely on the same page here. “Digital wolf” is great. I’m going to have to remember that one. Love the Spinal Tap reference. In fact great references all around. When I was a girl I used to make out with Luke Duke right on the TV screen. My dog is named Daisy Duke. Office Space is one of my all time favorite movies. Spot on with this one. Daisy Duke, my first crush. Thanks for reading! I know exactly what you are saying with the mothballs. Every time I smell one I think of grandmom’s basement, filled with its glorious treasures! Remember the first time you saw the rifle in that closet? I have twin sheet with dinosaurs on it and it reminds me everything fun about my childhood. I have had it since I can remember and it is a keeper!